The second edition of our comprehensive overview of the South African short-term insurance landscape is launching at the upcoming Insurance Conference - African Insurance Exchange 2018 - at Sun City, 29-31 July 2018. Among the first decisions taken when working on this book was to rename the work to align with the new insurance regulation. We changed the title from the formal ‘Short-term Insurance in South Africa’ to a more colloquial ‘Everything you need to know about non-life insurance in South Africa’. It turns out renaming the book was the easiest part of a revision that took more than six months, beginning November 2017. This book is the culmination of many hours of research and is as thorough an examination of the non-life insurance sector as can be fitted into 420 pages. It examines the sector from every angle, starting with an introduction to the principles of insurance – before taking readers on a journey through the history of the industry, locally and worldwide. We consider the business case for non-life insurance and reflect on the sector’s position in financial markets and the socio-political environment. The value of this work is found in its assessment of stakeholders in the domestic non-life insurance market with insurers and insurance brokers under the spotlight in chapter seven; and the regulatory framework laid bare in chapters 12 through 14. The book gives a thorough presentation of the insurer market at the end of 2016 based on the latest figures published by the insurance divisions at the new Twin Peaks regulators. It also provides comment on regulation in force or planned at 30 June 2018. Statistics are fleshed out with information from insurer annual reports and a perception survey of the country’s largest brokers. It has always been the authors’ objective to touch on all aspects of the non-life insurance environment. 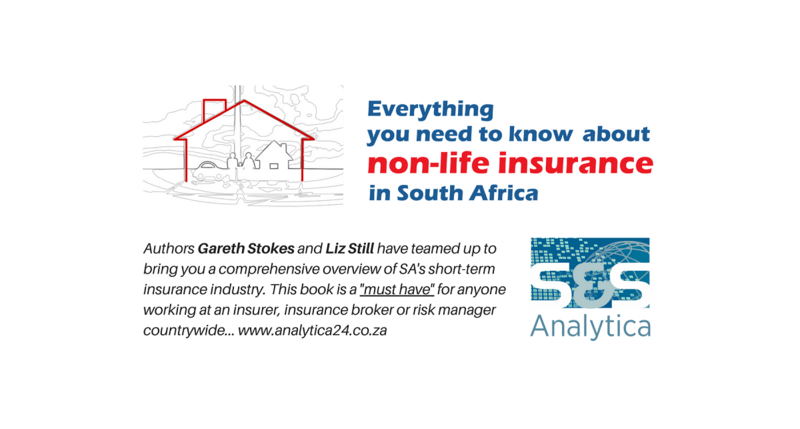 ‘Everything you need to know about non-life insurance in South Africa’ includes sections on insurance trends and new chapters on Insurtech – in recognition of the nature and speed of technology-backed innovation – and risk pricing – too keep the theorists interested. When read alongside our first edition, ‘Short Term Insurance in South Africa’ gives a useful snapshot for future trend analysis and evaluation. Insurance professionals, financial intermediaries and their clients, consumers and students of insurance will find great value in these pages. And the book is written in an easy style that makes it possible for anyone with an interest in insurance to dip in and out of the various chapters at their leisure. We thank each of you, our readers, for showing an interest in the book and wish you everything of the best in your careers in this challenging and exciting industry. This book would not have been possible without support from major brands in the non-life insurance sector and we wish to thank each of them; especially those who came on board in both the first and second editions of the book. Thank you to our two-term partners: Aon SA, Allianz, Camargue, Discovery Insure, CIB, Hollard, Old Mutual Insure, Santam and Sasria SOC Limited. And thanks also to our new partners for this edition: Auto & General, Bryte, Indwe, Lireas, Marsh, Tracker and Western. We hope that you enjoy reading this comprehensive guide to the South African non-life insurance industry as much as the authors enjoyed writing it. This was a labour of love; and our only wish were that we had more time – and more pages – to dedicate to this wonderful industry.